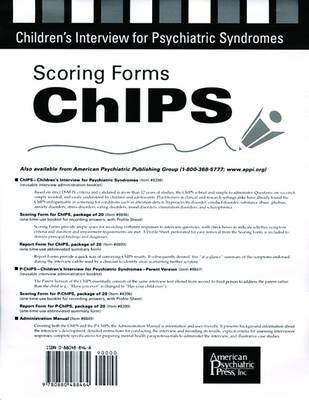 (One-time use booklet for recording answers with Profile Sheet) These Scoring Forms provide ample space for recording verbatim responses to interview questions, with check boxes to indicate whether the symptom criteria and duration and impairment requirements are met. A Profile Sheet, perforated for easy removal from the Scoring Form, is included to itemize principal findings and diagnosis. This is a package of 20. "The most user-friendly interview that we know. We recommend it highly to use on a regular basis in pediatric and child psychiatry clinics. It is an excellent teaching tool for psychology interns and child psychiatry fellows as they master diagnosis and assessment in child psychiatry." -- "Journal of Clinical Psychiatry"